Beautiful Saddlebred Five Gaited Head on a heavy cigar band. If you enjoy living in your jewelry, this would make a great addition to your collection. Meant for wearing everyday is ideal for this heavy cigar band. Enjoy it time and time again! Dimensions: 14mm wide from top view of the ring. Shank tapers down to 7mm on bottom. 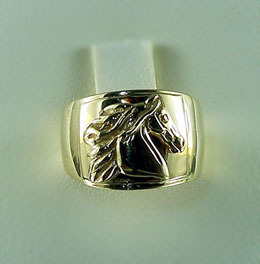 Available in 14kt yellow, 14kt white gold, and sterling silver. Try this piece two toned! Use suggestion box below.